Turn that unused car into a tax deduction. Volunteers of America Mid-States's Auto Donation Program accepts donations of cars, vans, trucks, boats, motor homes, and motorcycles. The vehicles are sold at online public auctions through Copart — a national auto auction broker — and the revenues are used to support our programs and services. It’s easy to do. 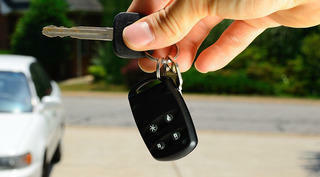 Skip the hassle of selling your vehicle. Pickup is fast and free. Just call (502) 636-0771 in the Metro Louisville area or 1-800-407-2600 from any other location, or use this online form. It’s good for you. We will mail you an official receipt acknowledging your charitable contribution. You can attach this receipt and claim a deduction on your itemized tax return for this year. Learn more about vehicle donation tax deduction. It helps others, too. Volunteers of America Mid-States has been caring for people in need for more than a century. Proceeds from your vehicle donation stay local — helping us do more to improve lives right in your community. You must provide the certificate of title on the car with no liens showing on it. The vehicle need not run, but it must have two inflated rear tires so it can be towed. If the car has a special license plate it must be turned in to your county clerk’s office or transferred to another vehicle before it can be donated. We can tow a vehicle anywhere in the country! For more information, please contact Robin Mohn at (502) 636-0771 in the Metro Louisville area or toll-free from any location at 1-800-407-2600, or RobinM@voamid.org.